In this guide you will find detailed information on how to query all the details and information (frame rate, resolution, video codec, audio codec) about your IP camera. To implement this example, you need to have OZEKI Camera SDK installed, and a reference to OzekiSDK.dll should be added to your Visual Studio project. 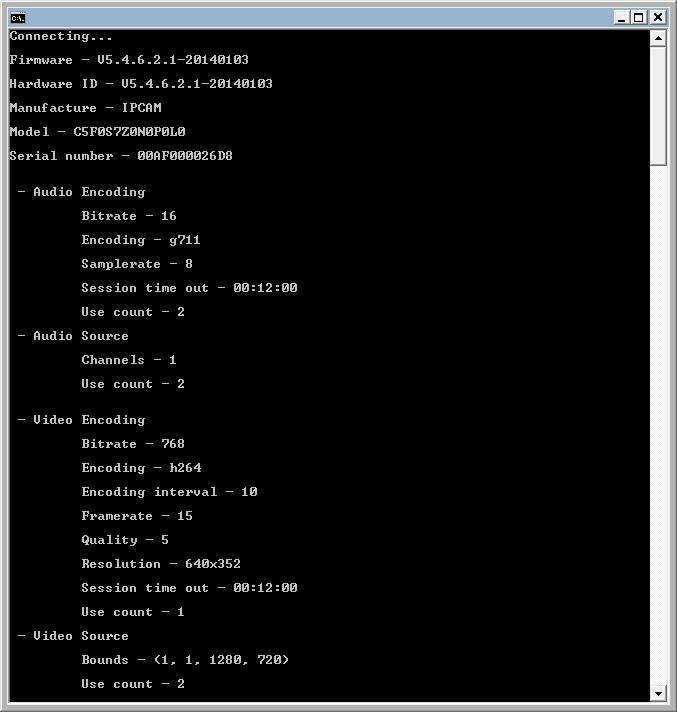 How to get all the details and stream specifications from an IP camera device using C#? Please note that this example is about a Console Application and not about a Windows Forms Application. The image of the camera is not needed, the console interface will be sufficient. To create a new Console Application you should choose the Console Application option in the new project window. In this case you do not need to copy the contents of multiple files. The only necessary source code is the one that can be seen on this page. After creating a new Console Application with the same name that you can see right after the namespace keyword, the only thing you have to do is to copy all of the code from this page into the Visual Studio (besides the usual to-dos like adding the SDK reference and modifying the project properties). EventHandler<CameraStateEventArgs>(Camera_CameraStateChanged): with the help of this line you can subscribe to the events of the IP camera. When the state of the came changes, the application is going to react to the event. static void Camera_CameraStateChanged(object sender, CameraStateEventArgs e): with the help of this method you can handle several events of the camera that can happen until the application is running. The first type of events is the handled event: after the camera has been successfully connected to the application the firmware and hardware details of the device can be listed. The second type of events is the streaming event: after the camera starts streaming both the audio and video stream specifications can be listed. Console.WriteLine(StreamInfoVideo()): the methods inside the Console.WriteLine() calls return a formed string about the different categories we are listing the information about. I see "unknown" in every fields. In this case your camera failed to provide any details to the program, but it works normally. Are there more informations about the device and the streams? After this, the Visual Studio will show the properties automatically. For more information, please check the definition of the IPCamera class.